At one time teeth whitening was an expensive and somewhat painful procedure that didn’t always make your teeth look their whitest. But today with new technology teeth whitening can be done at home inside of 3 minutes with amazing results. It’s safe, easy, and inexpensive. 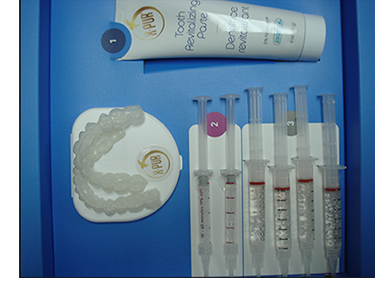 Using custom made trays made by Dr. Hakim, whitening your teeth has never been easier. Customized teeth whitening trays are basically molded trays that can be placed inside your mouth along with a teeth whitening gel. The gel used by Dr. Hakim is a unique tooth revitalizing paste (X-PUR by NovaMin) that provides Calcium, Sodium, Phosphorus and Silica, elements all naturally found in the body, to promote the natural remineralization process of dentin and enamel. NovaMin creates biomimetic hydroxyapatite (HA) tooth enamel to protect against tooth decay and to repair surface lesions. It’s antimicrobial and anti-inflammatory properties significantly reduce plaque and gingival bleeding, while protecting enamel against acid erosion and abrasion. Its best to use custom teeth whitening trays rather than the over-the-counter trays because they provide an impression for a better fit, which produces even whitening. If you’re looking for a whiter dazzling smile, ask us about this simple and safe procedure.